The Bowhead serves a purpose as the game's premier high-sec ship carrier. It has the ability to carry many fitted ships inside its massive Ship Maintenance Bay, allowing players who commonly need several fitted ships to easily transport their fleet from one location to another. Pilots who take part in activities such as Incursions will find great use out of the Bowhead, being able to use it to carry several fitted Battleships and Cruisers across high security space. Though the Bowhead has already impressive base health, the ability for the freighter to fit low slot modules such as Damage Control and mid slot modules like an Adaptive Invulnerability Field creates one of the toughest ships found in high security space, with potential to exceed over 500 000 EHP with ease. The Bowhead benefits greatly from skills that affect shield and structure health, though primarily the latter. Train Mechanics and Shield Management to V to greatly increase the base survivability of the freighter. And though the benefits are not as large, Hull Upgrades can add some additional armour to the already bulky structure of the Bowhead. As with all ships of this calibre, the Bowhead can rely quite a lot on the navigational skills of the pilot. Unless using a Microwarpdrive to decrease align times, increasing the ship's agility is a must for long trips through the galaxy as the long align time can lengthen your journey immensely. Train Evasive Maneuvering to V as soon as possible. The bonuses the Bowhead receives from ORE Freighter levels also aid in decreasing align times. As the Bowhead has a notably small cargo hold for a ship of its size, it is not all to punishing to fit Reinforced Bulkheads to instead increase structure health immensely. 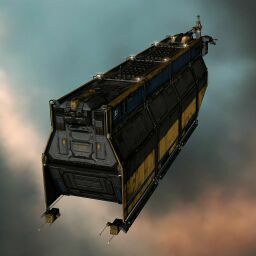 Unlike other Freighters, the Bowhead also has the fitting space to add a Damage Control; do not ignore this easily fitted module that will increase your Bowhead's EHP astronomically. For more information and suggestions on fittings, please visit the fittings page here. Though the Bowhead can carry fully fitted ships, it is not always necessary or wise to leave the ships with expensive modules equipped. Keep a quick-aligning Interceptor or two in your Ship Maintenance Bay at all times, and leave valuable modules attached to your ships in their originating station. Once the ships and their cheaper fitted modules/rigs have reached the destination, burn quickly back to your starting point in the safer and faster Interceptor to pick up the expensive modules, to avoid painting a target on your Freighter's back. Remember that ships in your Ship Maintenance Bay can still carry charges, such as ammunition and Nanite Repair Paste. Consider carrying a ship with a larger cargo hold than the Bowhead to bring more charges with you than the freighter itself can carry. Use a 500mn Microwarpdrive to decrease your align time to 10 seconds. If you use the Microwarpdrive for a single cycle while aligning for a warp, your ship will have crossed the required speed to enter warp by the time it finishes. This can allow you to fit low slot modules to increase your survivability rather than your agility. This page was last modified on 28 February 2019, at 21:03. This page has been accessed 113,907 times.